In the next series of articles I will create a journey through the different reason patches I have been developing for the upcoming free Reason refill called "Space Ambient". This series will the "background story" on how this thing gets developed. At the same time I will try to throw in some tutorial elements in there so you can build different set ups if you like. Int his article I will write down some element which I refer as being the LFO delay unit. In simple terms, you have an LFO, this one gets processed using an CV to Audio converter. This signal gets delayed and then the Audio goes back being a Control voltage again. Simply this creates a delayed control voltage signal. This delayed signal can then be used in a different context if you like. 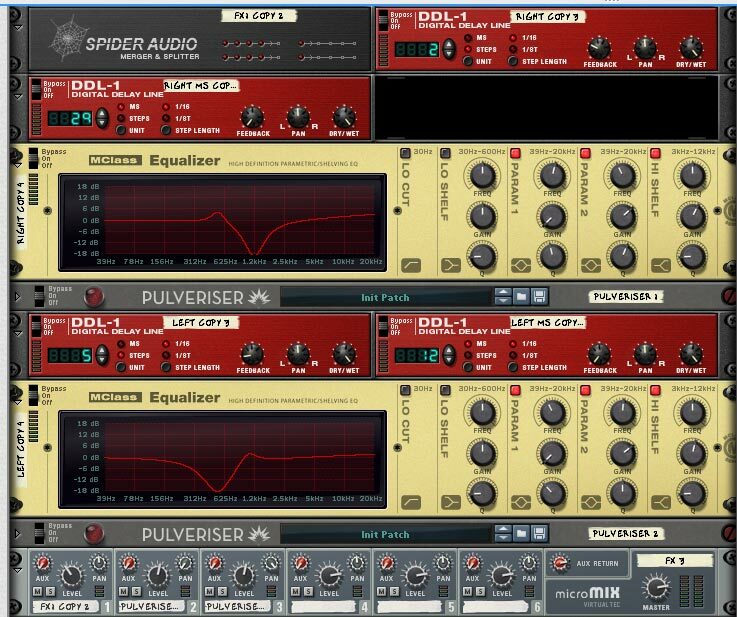 Another set up which I am going to share later this week is the Spectral Vocoder sweep. Which uses a similar technique. In the realm of the LFO Delay units, the volume is being used as the incoming CV signal. Meaning, you different effects per channel, and these effects will be turned on / off using a Delay. In theory this makes the transition from on a effect to another effect. Call it "effect sweeping" if you will. For the next examples (unless noted otherwise) I will be using this sound as being the sound source. It is a basic Saw wave using Phase Modulation on the second oscillator. 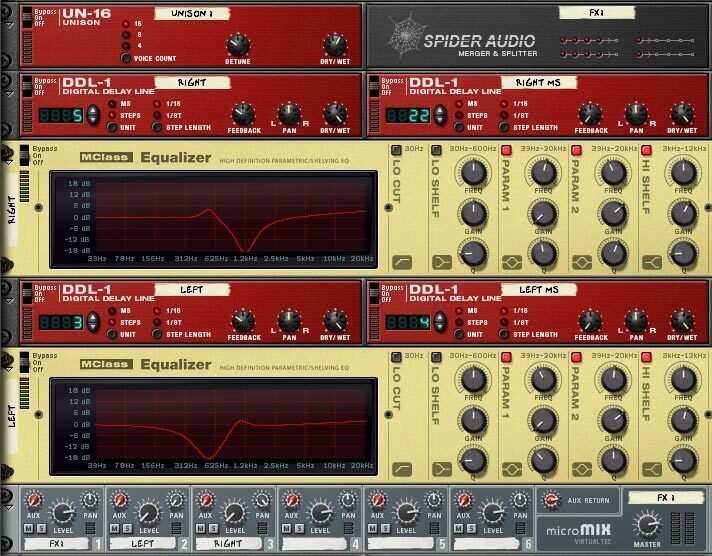 While the sound moves over time, the LFO1 will be changing the filter frequency (LP12). This is done intentional, since the system will then benefit from altering the filter frequencies. So every effect will then receive different frequencies every time while the sound progresses over time. In picture you can see how the effect chain is set up. It moves from Dry to gated reverb to a unison to an echo reverb. Inside the combinator there is a rotary called Vol Mov 1. I had plans to create a Vol Mov 2 eventually, but I ditched this due to CPU limitations (I didn't want to push the CPU too much on this). In this example I am increasing the volume movement knob while the sound progresses over time. The nice this about this set up is that it isn't sounding like a constant reverb effect. Since the effects are being turned on / off more or less using an LFO, it kind of feels more like an LFO on the reverb dry / wet balance (which isn't the case). Another nice side effect is that it also enhances certain frequencies using the Gated effect and the Echo RV7000. This will make the set up more interesting later on. While there is an LFO based on a Sine pattern, the LFO can be changed in speed using the Movement Rate knob. This speeds up / slows down the volume movement effect. The Reverb / delay settings are most likely the least interesting devices in this patch. Since these are a basic digital delay (3/16th) and a RV7000 Hall (with a long tail). 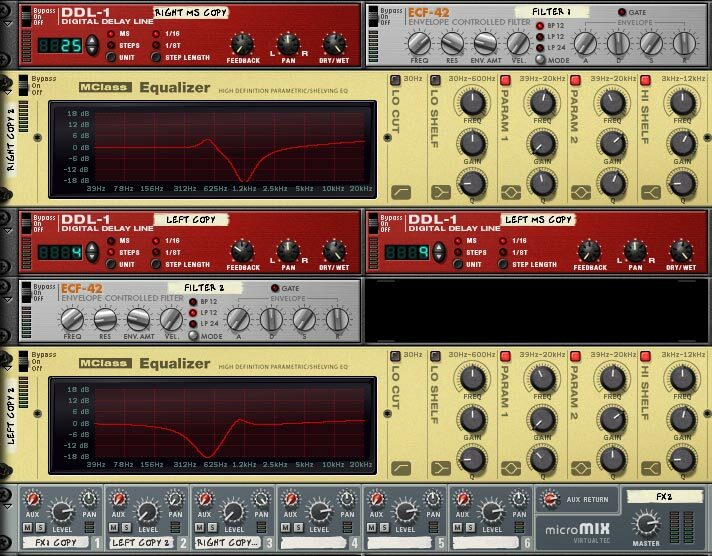 However, it is the combination of using the LFO Delay + reverb + delay which makes it interesting. In this line up, there are 4 different type of effects which are chained from FX1 > FX2 > FX3 > FX4. You can use just one or more effects in a chain. Ideal it wouldn't make much sense to turn these effects on / off (since they also change the space over left / right, which makes plopping noises). These effects are more meant as you set them once, and alter them when the sound isn't playing at all. FX2 - A spatial Filter chain using Bandpass over left and a LP12 over right. FX3 - A spatial EQ stage using different accents on different frequencies. In the next few series of articles I will take you on a journey through some of these patches while the refill progresses over time. As far as the release date goes, I am currently aiming for the end of may 2015. Since this package is still in its early development stages, it might be that the date might change. The space ambient refill will a free reason refill for Reason 7 and upwards.